Argh! 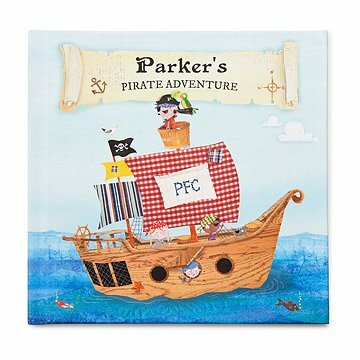 Give your little one's imagination a ship to sail on and cast him or her as an adventurous pirate with this charming personalized book. Filled with details like name, skin tone, home town, and more, this lively story shows a day in the life of your bucaneer. From following a treasure map to digging up buried treasure, your child will delight in seeing themselves sailing the high seas, swabbing the decks and singing sea chanteys. Hand bound in the USA. I purchased 3 personalized book and sadly this was my least favorite. The others used my grandchild's name more creatively and had additional opportunities for personalization by incorporating friends names. The personalization is what really drew me to this book. I know my grandson will be really excited to see a story where he is the main character and his family is mentioned as well. So adorable my sister in law loved the gift! The book is so adorable. I bought as a gift for my nephew. He is too young to read yet but it will be a great keepsake book. My sister in law loved it. Personalizing the book was the best part! After a month, I think my son is still in shock that he is part of a story. Love it!!! They love this book! They read it every night. Both boys loved this book! Wonderful - recipient LOVED it. These are wonderful books I will order for years to come. There is so much personalization. He's the main character of the book. I've purchased other personalized books but this one is A+! This book is cute, but the story is a little lacking. Just okay. Printed on cheap paper. Looks and feels like it was printed on a home printer. Not same quality as the other personalized books on this site.